You can now buy a music subscription from Google. Here's everything you need to know about Google's crack at rocketing to the top of the charts. 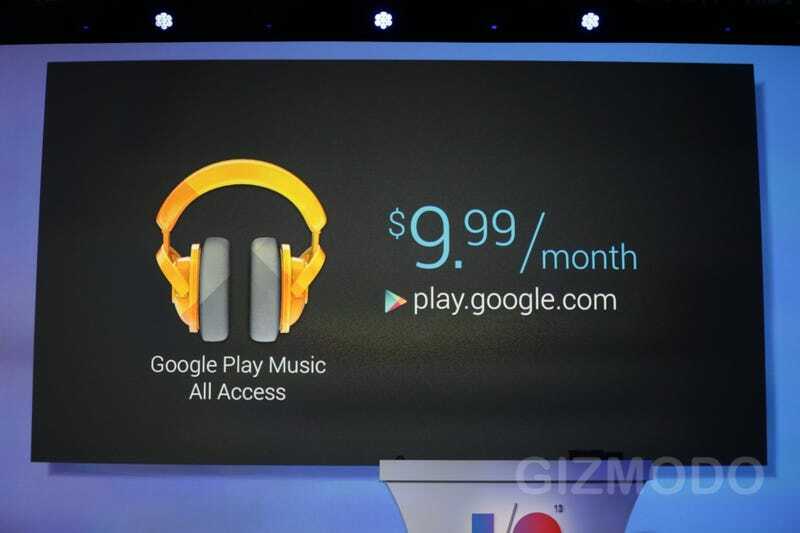 Get ready for Google Play Access. Google Play All Access launches in the US today. It costs $10 per month. Everybody gets a 30-day free trial, and if you sign up soon, it will only cost you $8 per month. During today's Google I/O keynote, Google introduced All Access, which it is better for music discovery than its competitors. At first, it seems like a simple on-demand-meets-radio service with the personalization options you would expect. It works on phones, tablets and web browsers. From a design and UX perspective, the innovation comes from the degree to which it's easy to switch between the hands-on and hands-off experiences. If you don't know what you want to listen to you can just hit "Listen Now" and start listening to something right away. When you want to geek out on Google's the huge on-demand catalog, you can do that too. The best part, though? You get to keep the awesome features that came with Google Music. They're totally integrated. It's on-demand music, radio, and online storage locker for your personal collection all in one place. Dope. Google has long been missing a streaming music answer to services like Spotify and Pandora. Google has the muscle—and, if you sign up early—a better price point—but the little guys have the head start. We'll have to wait and see which service comes out on top.